This Great War image collection is part of a display currently at Paris, to go on tour later this year. A hundred years ago next month, Archduke Franz Ferdinand and his wife were shot and killed by Serb nationalist agitators. The political fallout from that act drew the great powers into conflict, and by August 1914 the Great War began in earnest, with Germany's shattering victory at Mons over the British and French. Thus began the most devastating war Europe had ever known up to that point, four years of hell that saw the entire world sucked in. One in eight of those who went to war were killed; over 9 million soldiers dead, in all. 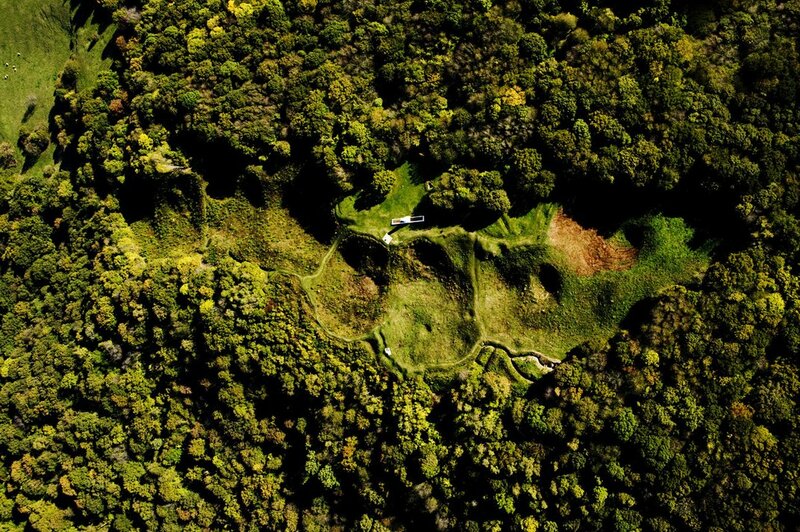 The pictures you see here are images taken from the battlefields as they appear today. 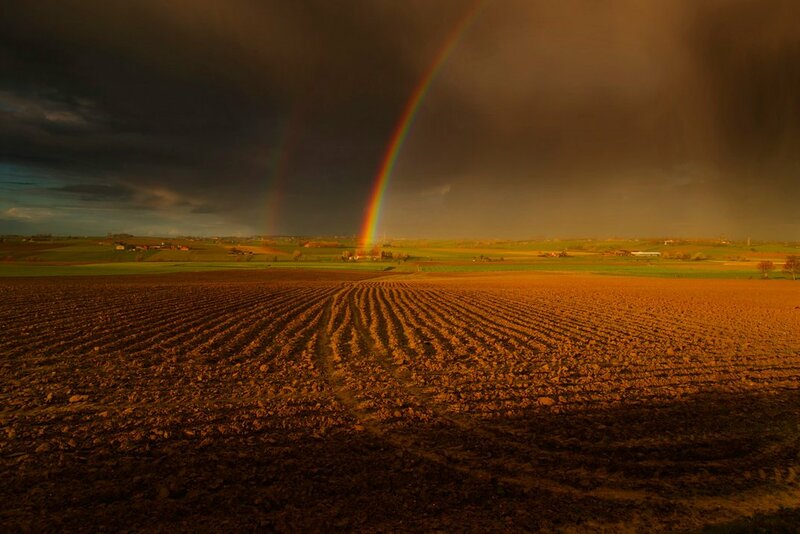 They are part of an exhibit Fields of Battle - Lands of Peace put together by Irish landscape photographer Michael St. Maur Sheil, currently on display in Paris, later to go on tour in the UK. Let me talk you through them. 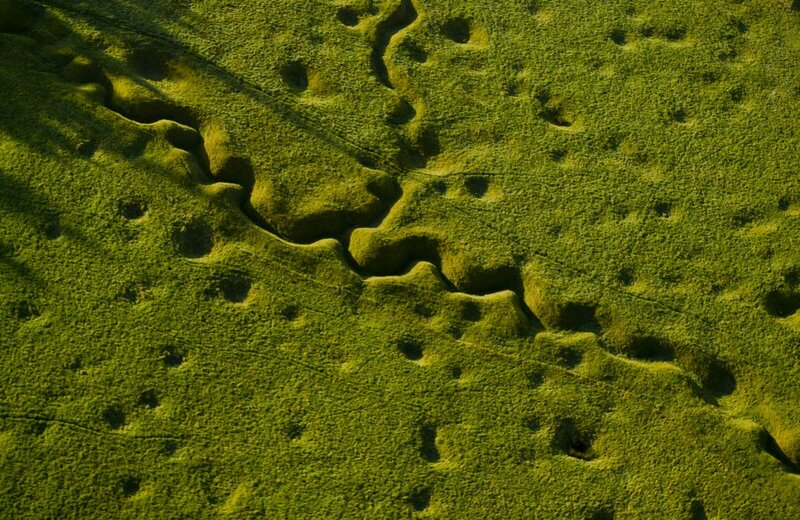 The first is the trenches of the Somme. That battle began July 1st, 1916, and lasted until November that year. The Allies attempted, unsuccessfully, to break through the German lines in the Somme valley. British casualties on the first day were the worst in the history of the British army; 19,240 men died on that day alone, of a total British casualty list of 57,470. It was so bad that the government of the day felt forced to release a movie soon afterward to show the public what had happened, a whitewashed documentary that spent as little time as possible talking about the casualty rate. It was, on release, the most popular film - in terms of viewer numbers - ever seen in the UK, and kept that distinction until the release of Star Wars. The second and third photos are Messines, and Verdun, respectively. 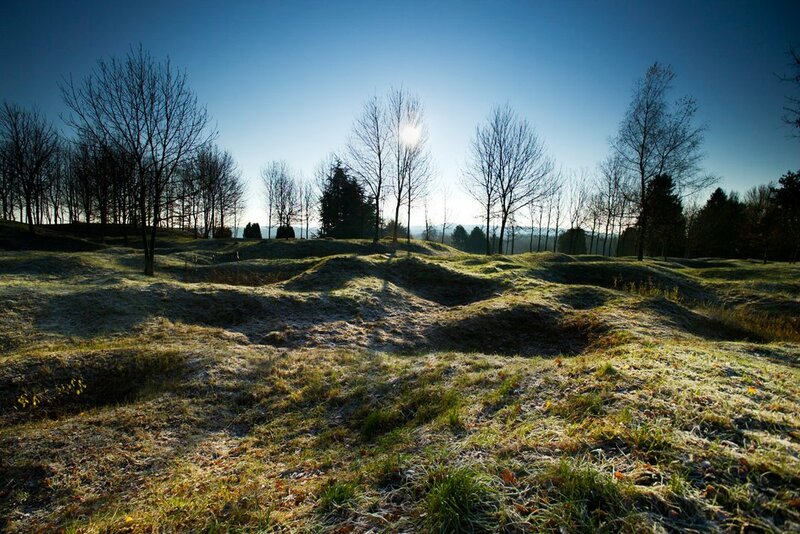 There were three battles of Messines, in 1914, 1917 and 1918; Verdun is, of course, the infamous mincing machine that inflicted nearly a million casualties, all told, from February to December 1916. The devastation was so total that, after the war, six villages near Verdun were officially designated Zone Rouge; they had died for France, and would not be rebuilt. 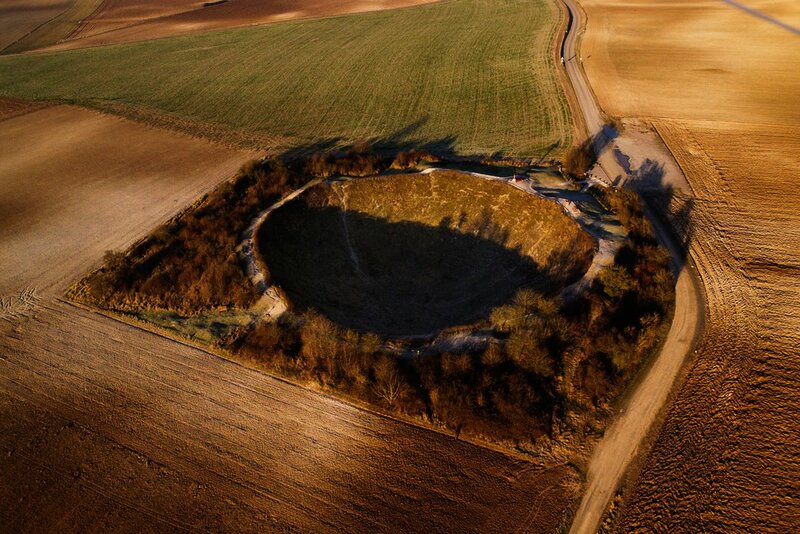 The crater you see in the fourth photograph also dates from the Somme. That is the Lochnagar Crater, created when the army tried to set off a mine underneath the German defenses as part of an attack. The explosion, it's said, was heard in London. "The whole earth heaved and flashed, a tremendous and magnificent column rose up in the sky," said a witness, flying overhead at the time. "There was an ear-splitting roar drowning all the guns, flinging the machine sideways in the repercussing air. The earth column rose higher and higher to almost 4,000 feet. There it hung, or seemed to hang, for a moment in the air, like the silhouette of some great cypress tree, then fell away in a widening cone of dust and debris." The fifth photograph is a village, Butte de Vaquois. It used to be on a hill, but three years of mines and explosions leveled not only the village, but also the hill it stood on. 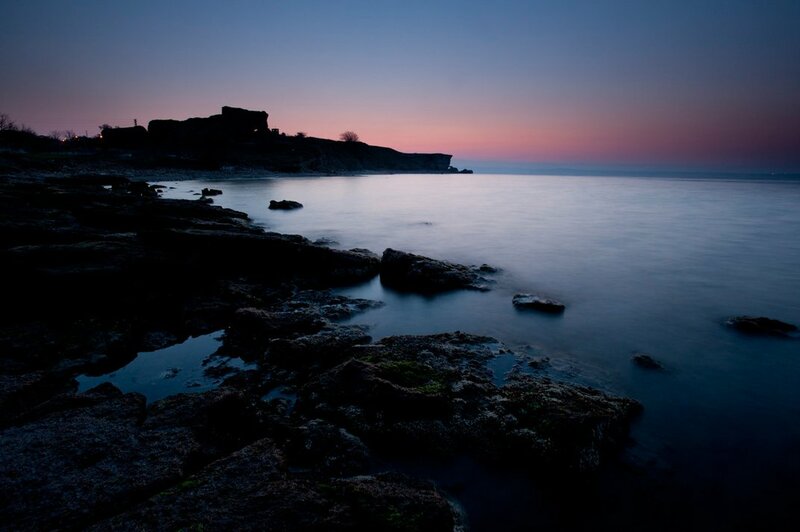 The sea view in the final photograph is Sedd el Bahr Kale, a fortification built in 1659 that overlooks the Gallipoli battlefield, in Turkey. The date of the landing, 25th April, later becomes ANZAC Day, in commemoration of the thousands of Australian and New Zealand soldiers killed. You're looking at V beach, one of five landing spots. Machine gunners firing from that fort slaughtered troops as they landed; of the first 200 soldiers to make the attempt, only 21 made it to the beach alive. The collection, says Sheil, is inspired by a battlefield visit he made with his father, who served in the London Irish Rifles and fought in France in 1940. "His soldier's eye was able to match the angles of church towers to the trenches they had dug and for the first time I appreciated the importance to the infantryman of even the merest ripple on the surface of a field." That experience stayed with him, and when the Great War centenary approached he decided to commemorate the event. The display is currently at Les Jardins de Luxembourg and will remain there until August. The War Graves Commission will make a book from this collection.